I had a surprise arrive in the mail not long ago. Apparently, one of Funky’s readers has a hobby of wood-burning iconic comic book covers and then coloring them. He sent me examples of some that he had done and they were amazing. 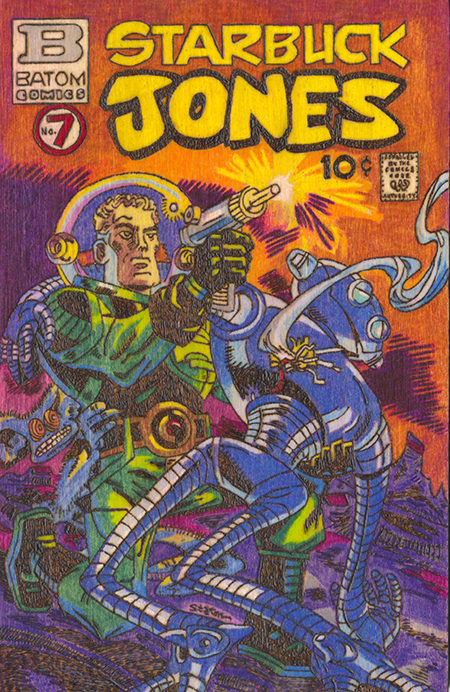 Much to my delight, included in the package was wood-burned and colored copy of the first Starbuck Jones cover that Joe Station had created for Funky. How one corrals the patience to produce something like this is beyond my ken, but, suffice to say, it now holds down pride of place atop the bookcase in my studio.